Our Timberline headboard is a step above the rest. It has a rustic feel with a bookcase look. Match it with one of the Northwoods dressers or night stands for a complete log cabin atmosphere. Our Timberline headboard is a step above the rest. It has a rustic feel with a bookcase look. 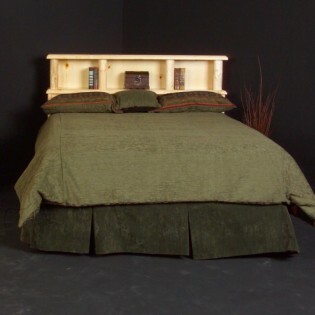 Match it with one of the Northwoods dressers or night stands for a complete log cabin atmosphere. Every piece is hand hewn to give it a more rustic look and every piece will be an original with the knotty pine and the natural drying process to add a personal touch.